There is no question that the gotcha moments that the media so desperately want to trap Republican candidates with is not to inform the American public, but to impress their peers. Wisconsin Gov. Scott Walker took a few shots at the press Monday, dinging reporters for a focus on “gotcha moments” he says are of little import to regular Americans. “You’ve seen in the media a lot of talk over the last few days about these self-made, gotcha moments from the media,” Mr. Walker said at a meeting of the National Religious Broadcasters, according to the Wall Street Journal. Over the weekend, Mr. Walker told the Washington Post he wasn’t sure whether President Obama was a Christian, as he hadn’t asked him or read about it. 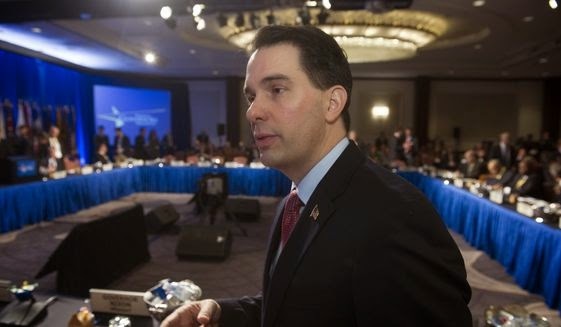 A Walker spokeswoman later followed up by telling the paper that “of course” Mr. Walker thinks Mr. Obama is a Christian, and that he thinks those kinds of questions distract from what he’s trying to do as governor. “It’s unfortunate the media chose to politicize this issue during our trade mission to foster investment in WI,” he added. But he did talk about his humble upbringing, as he prepares to possibly take on former Florida Gov. Jeb Bush, the son and brother of two former U.S. presidents, and former Secretary of State and former First Lady Hillary Rodham Clinton.